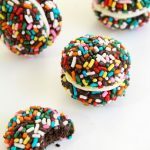 Crazy delicious glittering rainbow sprinkle cookies that melt-in-your-mouth, from Heather Baird’s cookbook, Sprinkle Bakes. 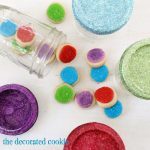 Read on to fine a review of the Sprinkle Bakes cookbook and for the recipe for glittering sprinkle cookies. 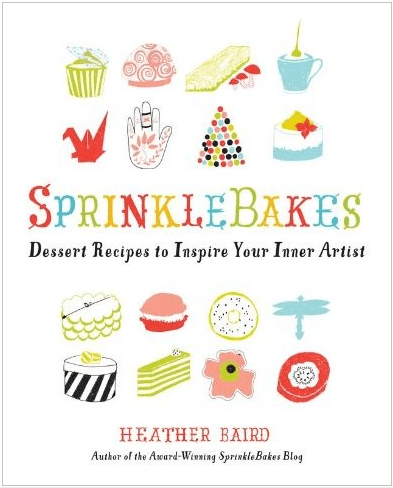 Sprinkle Bakes: Dessert Recipes to Inspire Your Inner Artist, by Heather Baird, published by Sterling Epicure, May 2012. I can’t possibly rave enough about the talent bestowed upon Heather of Sprinkle Bakes. In fact, I’ve raved before, when she guest posted for me making sprinkle sandwich cookies HERE, wherein I mention one of favoritest cakes, the red velvet homage to Poe. Sweets are the vehicle through which Heather creates art, in such a unique and beautiful way specific to Heather but appealing to all. 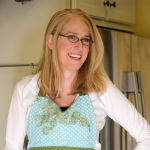 Her work is wholly original and stunning, and her book, Sprinkle Bakes: Dessert Recipes to Inspire Your Inner Artist, represents this fusion of art and baking precisely, or “artful baking,” as she calls it. 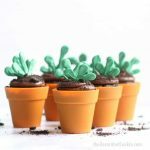 She provides lessons in sculpture, drawing and color theory as they apply to baking, and Sprinkle Bakes inspires the reader to go beyond the basics with their own creativity and imagination. 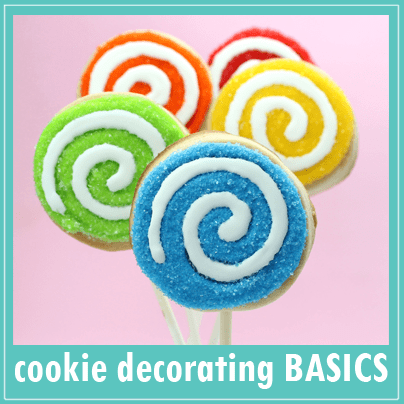 The book covers the basic equipment you need as well as a rundown of how to craft your blank canvas: cookies, cakes, icings, candy pastries and more. You learn how to paint, pipe, sculpt and build. You’ll make Queen of Hearts cookies, candy nesting bowls, pink peppercorn macarons, a glittering cookie tree and a gorgeous book cake. But more importantly, you’ll learn basic skills and witness artistic genius that pushes you to truly find your inner artist. And then get in the kitchen to let it out. 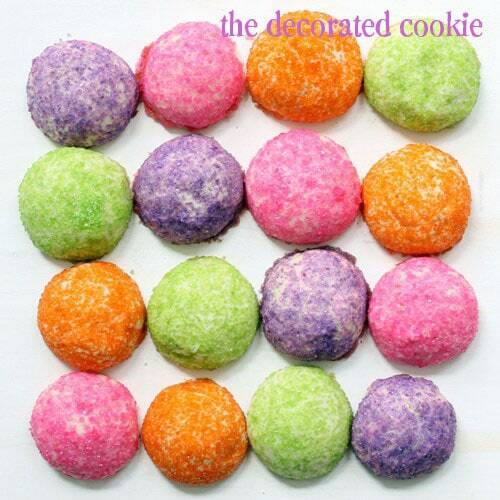 I made these sparkly, colorful, glittering sprinkle cookies which Heather made into a glittering cookie tree (p. 236). I skipped the tree and pretty much just ate them. 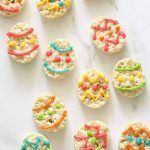 They are yummy, delicate, crumble-in-your mouth cookies, so it’s best to just pop them whole right in there. I was afraid I’d have none left to photograph because I ate seven before I even pulled out the camera. from Sprinkle Bakes: Dessert Recipes to Inspire Your Inner Artist, by Heather Baird, published by Sterling Epicure, May 2012. Preheat oven to 350 degrees F. Line 2 large baking sheets with parchment paper. Whisk together the flour, cornstarch, and salt. Beat together the butter and confectioners’ sugar with an electric mixer until pale and fluffy. Beat in the vanilla. At low speed, mix the flour mixture into the butter mixture just until a soft dough forms. Roll the dough into teaspoon-size balls and place on a baking sheet. Put each color sanding sugar in its own small bowl. Drop the balls into the sanding sugar, turning to coat. Reshape if necessary and return to the baking sheet, spacing the balls 3/4 inch apart. Chill sugar-coated dough balls in the refrigerator for 10 minutes. Bake until the tops are slightly cracked but still pale (the bottoms will be pale golden), 12 to 15 minutes. Transfer the cookies to a rack to cool completely. Looks like lots of wonderful ideas I can’t wait to try! This book looks really neat. And I’d like to win, not only because it looks like a fun book, but we also share the exact same name. I have a talented doppelganger?! I love the idea of sparkles but to make a tree! Cooler than cool! Looks like a book I would enjoy reading and then making the recipes. Would LOVE LOVE LOVE this! Thanks for the chance! You are so lucky to do this for a job! SO fun! This looks like a book I have to have! These look fabulous! I have got to try this recipe! beautiful. would love to win and bake the gorgeous recipes! What a nice book, and I love those glitter cookies, I will have to try even if I dont win this great giveaway. This book is an absolute necessity in my collection — cannot wait to get my hands on a copy! Love to win this book! Please pick me. Cookies looks yummy!! I would love, love, love, love, love, love to win this book. Heather is one of my baking heros!! I would to have this book! I want to try this recipe. Thanks! This book looks SO amazing! I would love to win!! I love those cookies!! 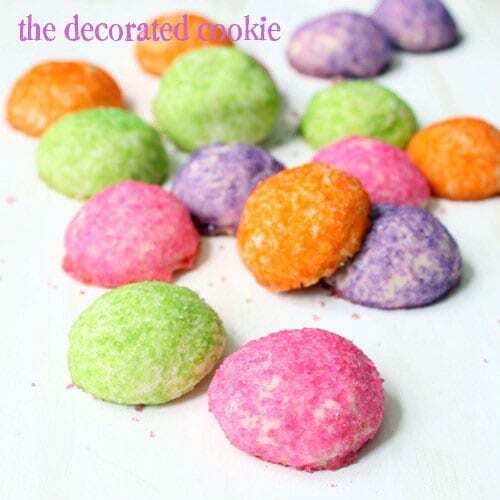 I’m throwing my daughter a rainbow bday party this summer and those cookies would be perfect!!! Both your websites look tasty! Would love a chance to try out the recipes myself! Cute cookies! I keep seeing so many awesome samples from this book lately! This book sounds fun! And those cookies are so pretty!! Nesting Candy Bowls.. that is beautiful! Even if I don’t win, I might have to just go purchase one anyway! these cookies are so cute! would love to try this cookbook out. I would really love to win your cookbook as I love your website and find that you give me more reasons to play with creative ideas in the kitchen, and I love to bake anyway. I can share with my daughter and granddaughter as well. Pick me. Will definitely be using that idea for my daughter’s rainbow birthday party in September! Thanks! Would absolutely LOVE to win this book!! The book is amazing, thanks for sharing! I just think this book sounds amazing!! The cookies are adorable..LOVE! These look great a nice weekend project for me and the lil lady!! 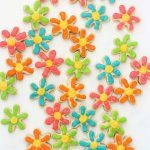 These cookies are such a fun way to brighten up a party table or even on a rainy day! Those cookies look to pretty to eat! I would love to win this book! Would love to win the book and add it to my growing wonderful collection! I would love to get my hands on this book! Everything looks so yummy! I would love to win!!!! Those pics of the cookies are beautiful! You have just awakened the cookie monster!! gonna have to try those cookies!! I have a kitchen aid mixer that my husband gave me recently..
I’m a novice baker …. and i’m fascinated with baking…. love the blog, love her recipes, would LOVE the book! You are both sugar geniuses! Would love a copy of this book. Thank you for sharing your talents with the rest of us. These cookies are so fun and I have been DYING to get my hands on this beautiful book! I would love to win this book and try a few things out. Amazing! I love sprinkle bakery! Love the cookies! Would love to win her cookbook!! That cookbook looks like fun. I sure could use tips of piping and decorating. Sometimes my goods don’t look as good as they taste. My daughters will love the cookies! Yum! Cute! I’d love to win this book. I would *love* to win! Please pick me! What adorable cookies! I love how the picture in the book has them assembled, too. I would love to win this book, thanks for the chance. Those cookies are adorable! Would love to win this book! Oh my goodness! I would Looooooove this!! Huge fan of both sites! Would love to win the book before I purchase! What gorgeous creations! I’d love to be entered. Wow, love Meaghan’s book and if she is recommending this, you know it’s going to be FABULOUS! Love all the bright decorations and designs. I love Sprinkle Bakes and would totally dig winning the book! Ooh! I love anything that has glitter! 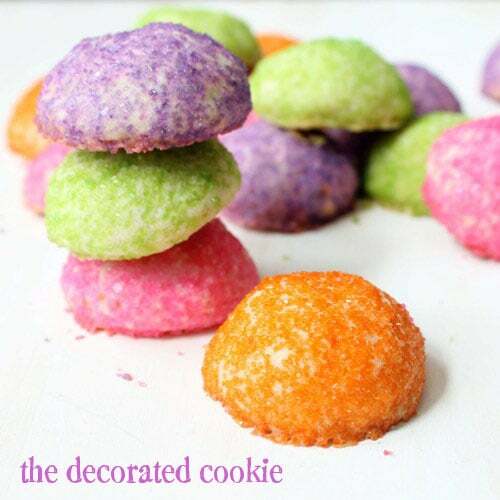 I love the concept of jewel colored cookies! Those cookies look awesome. Thanks for the chance to enter. I need to get this book! Loving the colors and sparkle. These cookies look amazing. Can’t wait to make them and try them. I have been a fan of Sprinkles Bakes for a while and have made several of her recipes, I would have her book! The book sounds great. Would love to have a copy!! I love deserts!!!! This book is awesome!!!!! I really like to make easy pretty cookies and sparkles? That runs me head-on into unicorn and glitter land! Yay!!! I want this book sooooo badly!! I love those sparkly cookies, I can think of all the possibilities! YUMMMMMM! Would love to try the beauties in the book. I want to make these, and the “glass” bowls, too! I already have the book, so hopefully this entry won’t steal a spot from someone else, but if it does, I know exactly who I’m gifting it to! These cookies look happy! and delicious! I can’t wait to make for the coworkers at the office! Thanks for sharing! This is perfect! I am holding a spa party on Thursday for my students who can’t afford to get their hair and makeup done before our 8th grade dance! I am going to make the pink ones to match our theme! WOW… LOOOOOVE the sparkling cookie tree! 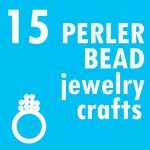 I love that you could change up the colors and make it for any occasion for anyone…Thanks for another super awesome giveaway. I can’t wait to see her book! It looks delicious! That book had been on my wishlist since before it came out! Her book looks beautiful, creative, and absolutely delicious!!!! Would LOVE this! These cookies look adorable. Thanks for the chance! Just can’t wait to go through Sprinkle Bakes a recipe at a time. A fantastic book! LOVE these! Making them is school colors for graduation! Those Chihuly inspired bowls look absolutely amazing!! 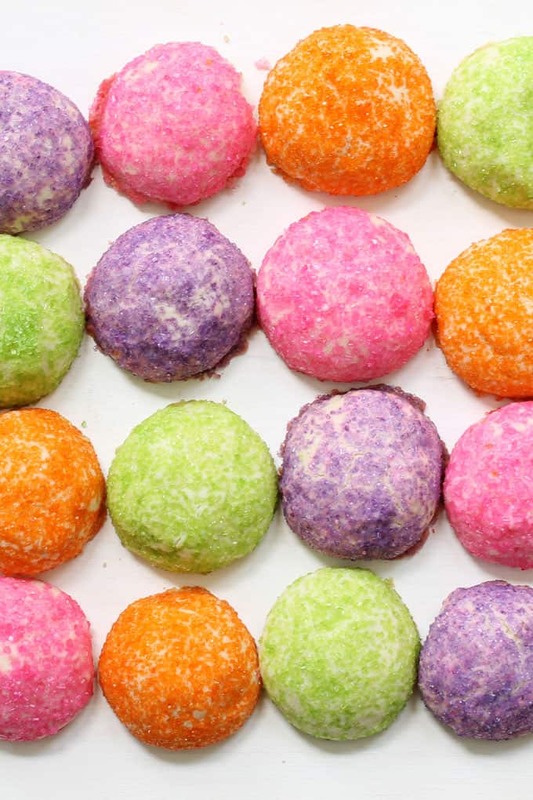 I love how the cookies look like jewels…so pretty! 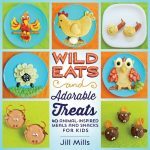 I would probably spend months in my kitchen if I won this book…yay!!! Fingers crossed for this one!!!! Thank you for pasting this sparkling treat. I bet they would be great ‘gems’ at a Princess or a Pirate party. 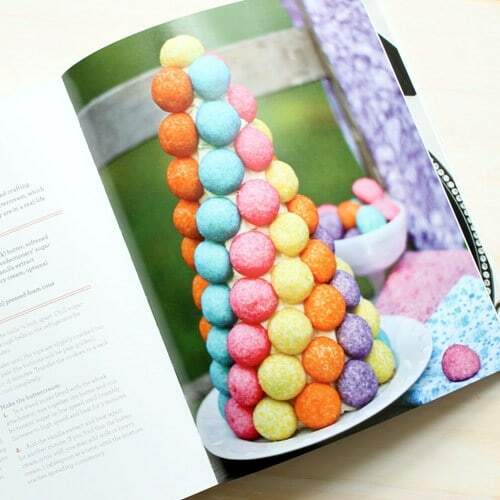 This book looks like the perfect challenge for a baker who wants to dress things up a bit. Love cookbooks, love cookies. Perfect. Pick me please. Love Love Love the tree! What a great idea! This cookbook looks amazing!! I’d love to have a copy! What a great idea!!! I really would like to get a copy of tha awesome book! This book would be great to win! I would love to try and make some of the cookies in this book! my wife would love this book, she just adores the website, i think the site is engrained in the computer screen! 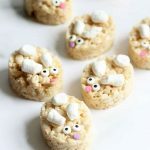 What a really crazy fun ideas for cookies. Would love to win this one. This book looks like so much fun! I would love to win it! I have one word for this book, WOW! This book would be perfect for me. I need ideas for my food. Adorable cookies! Great giveaway too! Superb cookie book. I’ll make space on my bookshelf for it, it will have “pride of place”. Those cookies look perfect for a princess theme party! I love the bright colors on the glitter cookie tree. Thanks for the chance to win this book. This looks wonderful – thanks for the chance to win! I be such a happy person if I won your book! Sounds like a great book. I love how pretty your cookies are. Awesome looking cookies. Can’t wait to try, will have to find sanding sugar to make them. The book looks so cute! I’d love a copy. I love these cookies! They are so colorful and fun! 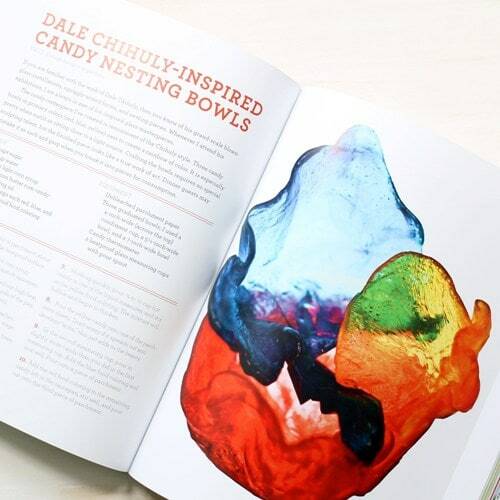 This book will provide the step by step instructions that non-artists like me need to create edible art. Thanks. I realize it isn’t ladylike, but the part about you skipping the tree and going straight for the cookies was so funny, that IF I had been eating cookies at the time, I probably would have spewed a (artsy and tasteful) cookie fountain. Instead of a tree, aim for a small starter plant. You should be able to save enough for that. Thanks for the baking levity! looks like fun! thanks for the giveaway! The timing of your post is perfect. I’m grateful for the introduction to Sprinkle Bakes and her sparkly sweets! I am going to make them for a wedding shower in the wedding colors of majestic purple, white and lime green and put them in clear glass ginger jars. would love to win the book! cookies look great. I’m starting on decorating cookies and this book will be a perfect inspiration! I follow Heather’s blog and love her work. I would love her book to inspire me further!